Lately there has been a lot of talk about how guest posting has gone down hill.While there are tons of guides on how to write a good blog post, there are some things about guest posting that are unique. So I want to focus on fixing the problem of bad guest posts with a visual guide to a great guest post. There are diagrams around the web that cover a good post, but that all seems to go out the window when a guest post is actually written. This might have to do with how much people pay writers or the commoditization of it all. Regardless, there are people looking for how to create an epic guest post and I want to share tips on how to write a great guest post. We want you to be successful and we want to stop seeing bad guest posts. Most of our outreach team and consultants can spot a guest post a million miles away, and I want to stop being able to do that. The key to a great post is for it to be indistinguishable from a regular post. The only difference is that it is written by someone who does not own or work for the site in question. Blog owners can smell when you are not real. Trust me, I've tried to have a pen name and unless you are dedicated to having a pen name, it just doesn't work. Faking a real person is hard. Use your real name, be transparent. Real people get real replies. Your homepage or product pages are rarely credible resources for an article. If all the links in an article are to one domain, anyone can see the intent behind the post: advertising. If a human can see it, search engines can, too. Credible resources are studies and other articles that support your claims and arguments. Link to your inspiration for the article - share the link karma. It'll come back to you. If you are posting on a topic and the site owner likes the idea, s/he probably already has some thoughts on the topic. Link to the site owner's past posts that support what you're saying. You'd do it for your blog, why not theirs. And I know you've read their blog already. I know you or your SEO wants you to get a link with "payday loans" (insert your own term here) but if it doesn't make sense in the post, it's just going to cause problems. Site owners will reject your post, and if it is posted, it'll most likely be on a poor quality site or will add to any other Penguin related problems. 6. Write for the reader. This one shouldn't need explanation, but don't try to sell. Don't try to write a piece for a link. It's going to show. Exact match anchors are declining in importance. Link to something readers will find useful and enjoy. It's about them, not you. You're the writer. You need to support this piece with your time and attention. Adding in your own anecdotes will show that you are a real person and readers can relate to your story. Homepage links to your blog are cool. Twitter profiles even better. Again, the link here should make sense if there is one. Some random company? Not cool. Their product or category page with exact match? No. This is a bio, only add links that make sense: those that describe you. I challenge all of you to do better, and I am taking the challenge myself. Don't let poor quality content slip through the cracks. Don't do things just because you need to hit a metric, get a certain number of links for the month. Write great content for others, that is how guest posting started. 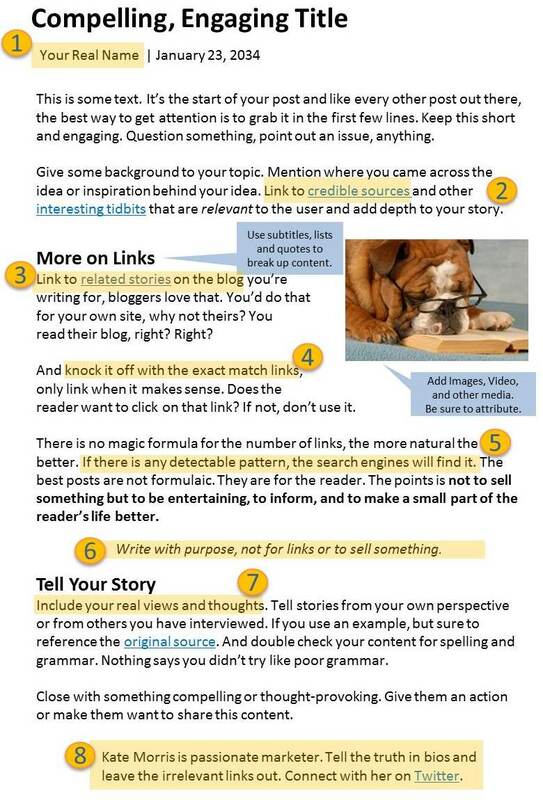 Share this image and maybe we can get guest posting back to where it started, as a great way to get exposure and help others with the problem of content development.